This summer sausage is flavored with jalapenos and cheddar cheese, and made from elk hunted by our own Jason Berry from his archery hunt in New Mexico. With a Weston Meat Grinder and Weston Sausage Stuffer from our Realtree line, plus Weston Mahogany Casings, Hog Ring Pliers, and a Weston Propane Smoker, we made one of the most delicious snacks around. Weston Mahogany Casings - 2.5" x 20"
Place the mahogany casings into water and allow to soak at least 20 minutes. 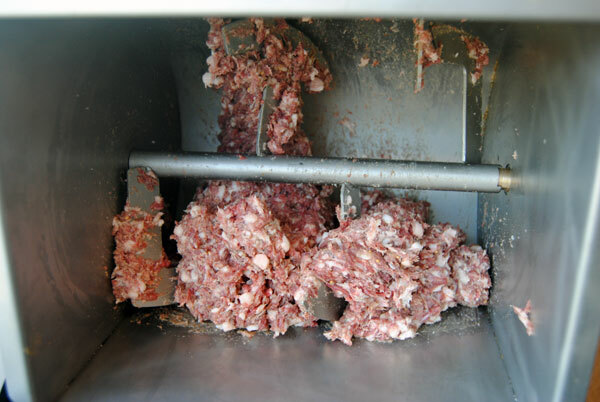 Grind elk and fatback through the coarse plate of a Weston Meat Grinder, then repeat through a medium plate, keeping the fat and meat as cold as possible throughout the process (not only for food safety, but also to keep the fat from melting into the meat). It helps to put your grinder head and tray into the freezer ahead of time and to keep the meat in the refrigerator and the fat in the freezer until right when you're ready to use it. 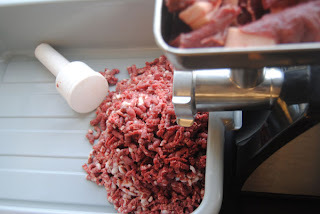 Put the meat mixture and the remaining ingredients into a Weston Meat Mixer and turn the handle (or turn the grinder on if you're using the 44 lb that attaches to Weston Commercial Grade Meat Grinders) until the meat is fully mixed. Lid is removed for photo purposes only - Be sure to always secure the lid when operating your mixer. With the largest stuffing funnel attached, tilt out the canister of your Weston Sausage Stuffer and fill with the sausage. Secure the canister in place. Remove your mahogany casing from the water and pat dry. Next, keeping the casing pressed tightly to the nozzle, begin turning the handle of your stuffer. Be sure to fill the casing as full as you can without breaking it. Mahogany casings are very durable, so don't be afraid to keep that casing pushed against the nozzle until it feels firm. Continue to fill the casing until there is about an inch and a half left. Twist the end tightly, then use your Hog Ring Pliers to secure the end. Place in the refrigerator for 48 hours to allow the curing process to occur. Preheat your Weston Smoker to 150 degrees, dampers closed, and soak your wood chips. After a half hour, fill your water bowl, open the dampers slightly, fill the smoking box, and place the summer sausage on a rack. Smoke for 2 hours, monitoring the temperature. After 2 hours, raise the temperature to 175 degrees and smoke for another hour. 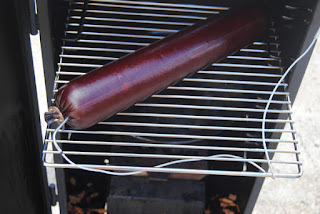 At this point, check the internal temperature and continue to smoke until it reads 155 degrees F.
Remove the summer sausage from the smoker, place it in an ice bath in a Weston Meat Lug for about 5 minutes, or until fully cooled, then refrigerate at least 24 hours (to set the fats and allow the sausage to solidify). 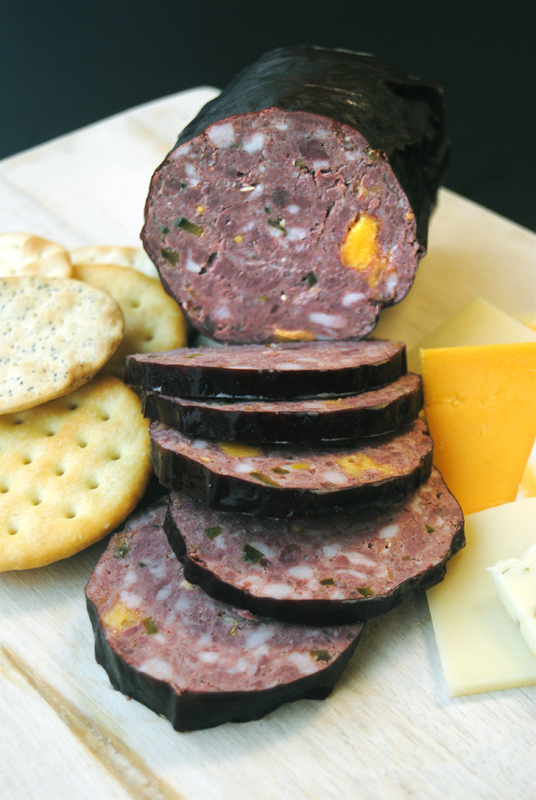 We served ours with various cheeses and crackers (although most of us just gobbled down the Jalapeno Cheddar Summer Sausage without them). Hi Eric: Sorry, but we do not sell elk meat, we sell the products to process your own wild game. Also: In the state of Ohio, where we're located, it is illegal to sell wild game that has been hunted for sport as it is not inspected or regulated. Good Luck in your search! How long does this type of summer sausage last in the refrigerator?